Welcome… to the new world of planning your own goodbye party. No matter that you won’t be there to enjoy it. The secret is that your fun comes now, in the planning of it. 1. You’re a pragmatic and fun-loving person. When you say you don’t want people moaning at your funeral, you mean it. 2. You’ve had a life you love and want that good fortune reflected in your send-off. 3. Your legacy is too important to leave to amateurs! You want a say in the matter. 4. You’re brave and forward thinking. You’ve been known to buck tradition. 5. 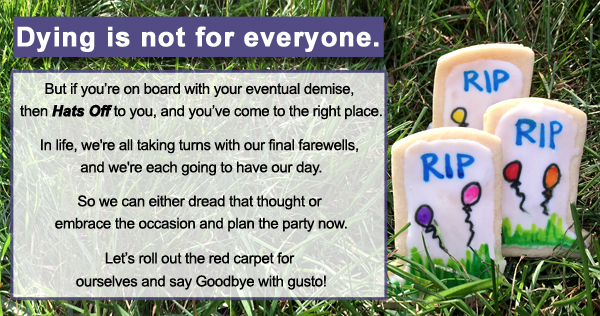 You’ve secretly envisioned your own funeral and it’s pretty darn party-like. I’m intrigued, but really… Who does this? People will think I’m weird. 1. You’re right! It’s not exactly a thing yet. But times are changing. Trailblazers will help move things along. And you kind of like being a trailblazer, truth be told. 2. You’re right! And that is exactly why it’s needed. Our taboo against death talk has kept us in the Victorian era. Everything in our 21st century lives has evolved except our funeral customs. Is it not time for an upgrade? 3. You’re right! But weird is in the eyes of the beholder. All it means is you’re not afraid to think for yourself and are open to new, improved ideas. Hmm, I need time to digest this. Any advice? 1. Relax, put up your feet. The Grim Reaper’s probably not coming this week. But you never know… just saying. 2. Imagine never making any decisions about what happens when you croak. Nada. Zippo. You completely looked the other way. You slacker! That’s not nice to leave such a mess for your people! And honestly, putting it off = never getting back to it. By default, it will become something you never took care of. Don’t be that person. 3. Take a moment and think of one or two songs you’d like played at your goodbye. If doing that makes you smile, chances are you have other good ideas just waiting to be cajoled out of you. You’ll be ready soon enough. I’ve Already Told My Family What I Want. I’m Good. 1. How good is your memory? (Sorry to remind you.) Your funeral musings are competing with nine thousand other things any given person is trying to remember each day. 2. Perhaps they know it now, but in the anguish of the moment they won’t be thinking straight. It’s a lot of pressure for someone to accurately remember what you mentioned in passing, and perhaps many years before. 3. Having your goodbye ideas written down, in your own handwriting, is an indisputable document of your wishes. Why gamble on someone else’s gray matter when it can be so easily assured with a pen and paper? Your family will think you're crazy, but you'll show them.